Agents in dynamic environments have to deal with world representations that change over time. In order to allow agents to act autonomously and to make their decisions on a solid basis an interpretation of the current scene is necessary. If intentions of other agents or events that are likely to happen in the future can be recognized the agent’s performance can be improved as it can adapt the behavior to the situation. In this work we present an approach which applies unsupervised symbolic learning off-line to a qualitative abstraction in order to create frequent patterns in dynamic scenes. These patterns can be later applied during runtime in order to predict future situations and behaviors. 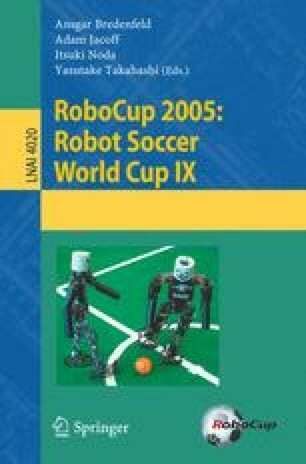 The pattern mining approach was applied to two games of the 2D RoboCup simulation league.